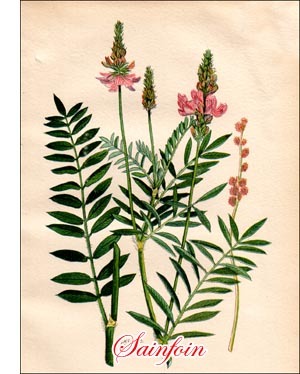 Sainfoin is perennial with a vigorous taproot which becomes rather woody and much branched. The stems are numerous, erect or ascending, and reach a height of from one to two feet. The leaves are compound and generally consist of a great number of leaflets, which, with the exception of the terminal odd one, are in pairs along the midrib. The flowers are in a rich, spike-like inflorescence which gradually becomes long and thin. The flowers, which are very showy, are pink with darker veins. They are rich in honey and allow the ordinary honey bee and other insects to reach the bottom of the tube where the nectar is stored. Sainfoin is indigenous to temperate Europe, from the Baltic in the north to the Mediterranean in the south, from the Atlantic in the west to the border of Asia in the east. It is also a native of southern Asia. Sainfoin has been cultivated in France for more than four hundred years, whence its cultivation spread to other European countries, especially Italy, England, Switzerland and Germany, where it is now considered an important forage plant. It was introduced into the United States about ninety years ago. The results of fifteen years' work at the Central Experimental Farm, Ottawa. favour its introduction into certain parts of eastern Canada. In central Europe Sainfoin grows naturally on dry, sunny hills, along borders of woods, etc., wherever the soil is rich in lime. Lime is necessary to its development and it can be successfully grown almost anywhere where the supply is sufficient. It should succeed in many districts of eastern Canada where there is a limestone foundation. It makes an excellent growth on a deep, porous, well-drained loam containing a fair proportion of lime. Heavy clays are less suitable as growth is generally too slow, and low-lying land covered with water during any part of the season is as bad as swampy land or land with a�-et subsoil. Sainfoin is best adapted to a temperate climate with a medium amount of moisture. On account of its deep root system, however, it is extremely resistant to drought and makes a surprisingly good stand when most other forage plants would suffer severely from lack of moisture. Once established, it stands the winters of the Ottawa valley fairly well. It is sometimes difficult to obtain a good stand of Sainfoin. The seed is often poor and yields only a small percentage of strong, vigorous plants. Weeds are liable to crowd out young Sainfoin and it is important that the land be kept clean. When it is well established on suitable soil, it will produce crops for many years. In Germany it is by no means rare to find fields twenty years old. Tests at the Central Experimental Farm, Ottawa, however, indicate the advisability of allowing it to remain for three years only. It can be best compared with Alfalfa, but it has the advantage of making a better growth on poor land. Its name, which is of French origin and was originally written Sain foin,* means "Wholesome hay." Sainfoin should be cut for hay when in bloom. The stems get woody after flowering is over and the hay is poorer. Occasionally two crops can be taken the second year. After the last cutting the plants should have time to produce a reasonable growth for winter protection. Sainfoin starts very early in the season and can therefore be pastured at least as soon as Alfalfa. It makes an excellent pasture, especially liked by sheep. It does not cause bloating and is therefore preferable to Alfalfa for cows and sheep. When grown for hay or pasture, three to five bushels of seed should be sown to the acre.